Killer Characters: My Biography is Out! Yesterday, author Amanda Flower released the first part of my story in the book A Plain Death. Amanda called this work a mystery novel but I call it a biography. We have agreed to disagree on this point. Either way, I’m nervous. 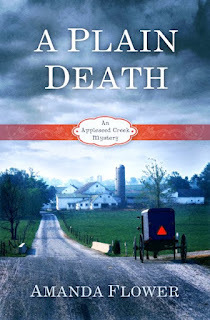 I never knew taking the job as Director of Computer Services at Harshberger College in the middle of Ohio’s Amish Country would lead to a book, and I certainly didn’t know that it would lead to me taking in a runaway Amish girl, Becky Troyer, or to the death of a beloved Amish bishop. 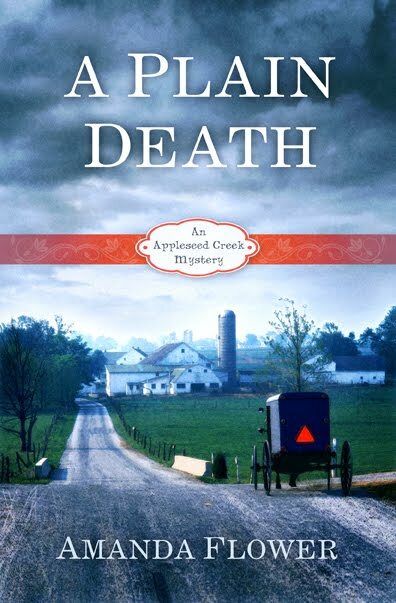 With the help of Becky’s very handsome Amish turned Mennonite brother, Timothy, I investigate the bishop’s suspicious death. You will have to read the book to find out if we’re successful in solving the case. If you plan to purchase A Plain Death, please do so in the next couple of weeks. The first two weeks of a book’s release determines its overall sales. Amanda is a librarian and would be annoyed with me if I didn’t add that libraries love getting patrons' book suggestions, so please ask them to order A Plain Death. Both Amanda and I hope that you enjoy the book! Tells us what you think with a review on Amazon or Goodreads. Congratulations on the release, Amanda. Best of luck with the new book! Congratulations on your book release. I've read the book and it's a great beginning to I hope a long series. Thank you so much, Dru! !